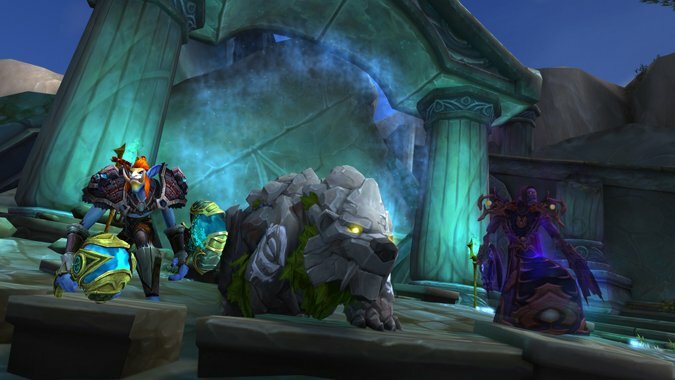 The patch 7.2 PTR just went offline for a new build, and when it returns it will feature flying, class mount quests, changes to Mythic+ affixes and rewards, and the Cathedral of Endless Night dungeon. We knew most of this was coming, but the Mythic changes are a surprise — and, at least to me, a welcome one. Now Mythic+ dungeons reward more Artifact Power depending on the length of the dungeon. That means you’ll get less AP for running a quick Maw of Souls and more AP for slogging through Halls of Valor. You’ll also receive bonus AP in your weekly chest based on the highest level Keystone you cleared during the week. The goal is to give you better rewards for time spent and encourage playing higher level Keystones instead of just running Maw of Souls +1 all week. We’ll also be getting some new affixes — Bursting, Fel Explosives, Quaking, and Grievous — as well as tweaks to existing affixes — Bolstering, Necrotic, Skittish, Fortified, Tyrannical, and Sanguine. To top it off, Overflowing (my most hated affix) has been removed completely. Lore didn’t offer any insight as to why, but I wonder if it was because it was a big challenge for healers but didn’t necessarily require anyone else in the group to change up their playstyle. As a Mistweaver Monk, I avoid this one because my toolkit seems to be geared towards overhealing — between Gust of Mists and Soothing Mist alone, I’m practically guaranteed to overheal, even if I could put together a gear set with zero Mastery. For all the details on the latest PTR build, see Lore’s complete notes below. And for those worried about datamined numbers for Artifact Trait costs and Artifact Power gains, don’t panic — yet. Blizzard hasn’t finalized what these will be yet. Currently, Trait costs increase exponentially while AP gain increases linearly. Blizzard aims to have these be a similar difficulty to earning Traits now, and we should see actual numbers in the next build. Read his full comments on Traits and AP for the details.